You didn’t get into Stanford. Your parents think you didn’t work hard enough, and you think they see you as lazy. Grandma and Grandpa see you as lazy because your cousins had no problems getting into their first choice, top tier college. Your aunts and uncles all wonder what’s wrong with you. And, to make the sting hurt that much more, your best friend who chose Stanford as their back up school got in and they didn’t even try! You work hard, give everything your all, but these little “failures” just add to your lack of motivation. And the depression…it seems to be taking over your life! Why bother trying anymore? It’s like there’s this big grey cloud over your head and everything that could go wrong will go wrong. Your days now consist of daydreaming of what you could be doing with your life, sending out resumes to companies who don’t respond, applying for programs for which you don’t truly qualify for. You don’t see the point in getting out of bed anymore…you feel you don’t have the Midas touch – everything you touch breaks and turns to ruin. You just can’t do anything right. You’re not the child your parents ordered because, according to them, you can’t do anything right. Believe it or not, but this scenario would qualify you as suffering from Failure to Launch Syndrome (FTL). Failure to Launch Syndrome describes a young adult who might be “stuck” or unable to move forward in a way that seems appropriate for one’s age. When every attempt that is made to move forward is met with what feels like resounding disappointment and failure, young adults tend to get stuck and fixated on the fact that nothing they do can be done right. There are many challenges and road blocks to navigating adulthood. It’s hard!! What appeared to be so easy when our parents were young is a whole different ballgame now-a-days. 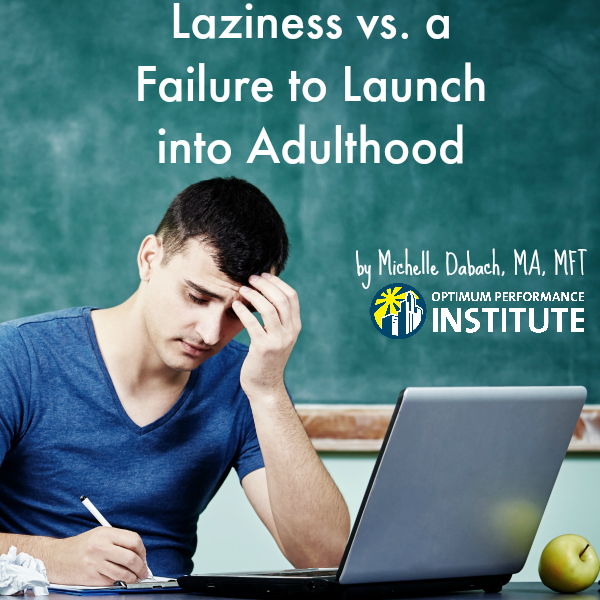 Failure to Launch Syndrome does not mean that you are a failure. I repeat: YOU ARE NOT A FAILURE just because you might be struggling with Failure to Launch Syndrome! You might just need an understanding and guiding hand to help nudge you in the right direction – someone to help rebuild your self-esteem and show you that you can be successful. At Optimum Performance Institute, we specialize in Overcoming Failure to Launch Syndrome. Our staff takes the time to learn about and understand you, your family, and your world. We address all issues interfering with your path to success by utilizing a multi-focal treatment approach, including, but not limited to psychological/psychiatric components, psychological/educational components, psycho/social components, and opportunities to express and experience joyous parts of yourself. OPI programs offer nurturing environments that focus on helping individuals build successes, no matter how big or small. Our experienced clinical team and personnel, dedicated Departments of Educational Services, Career and Volunteer Services, Extracurricular Activities, and Life Coaching, along with our OPI Living facility location in Southern California, make it possible for us to find opportunities you can truly get excited about so you can begin to expand your horizons. This excitement is essential because it enables you to share a joyous part of yourself, which, when reflected back, helps create hope for the future. It isn’t fair for any parent to say their child “isn’t what [they] ordered” just because of some minor setback. Everyone needs love, nurturing, and support and declaring that a child isn’t what the parent ordered just because of not gaining admission to a top tier, first choice college is anything but supportive. For more information on OPI’s residential and intensive outpatient (IOP Day Treatment) programs and our measures to help young adults overcome anxiety related Failure to Launch issues, call us at (888)-814-5985 or click HERE to submit an online form. We want to help and will be in touch promptly. Should You Let Your Adult Son or Daughter Move Back Home? How does Helicopter Parenting play into Failure to Launch?